These light-weight ovate wire PAC springs are the perfect fit for reliable high-rpm hydraulic roller and flat tappet cams. They are designed to install at 1.650" and produce 150lb closed pressure and 280lb open at .500" lift. Maximum lift .600". The best part, no machine work is required to install in a stock head. The spring's ID locates perfectly on the factory valve guide boss OD. 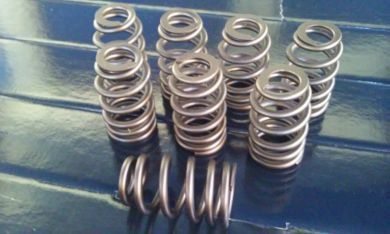 Price is for set of 8 springs. These are also available as a kit with matched retainers and locks also.